Nassau Suffolk Water Commissioners' Association brushed up on hurricane preparedness at a recent Hurricane Seminar hosted by Town of Oyster Bay. August 18, 2014 - Oyster Bay, NY - As part of an ongoing commitment to ensure the safety of water supply operations in all member districts, the Nassau Suffolk Water Commissioners’ Association (NSWCA) attended the recent Hurricane Seminar held at the Morrelly Homeland Security Center, Bethpage, NY. Deputy Commissioner Leonard B. Symons of the Town of Oyster Bay presided. The NSWCA was represented at the event by NSWCA Secretary Andrew Bader of Plainview Water District, and Commissioners Richard Niznik and Michael F. Rich III of Oyster Bay Water District. Focusing on effective planning for potentially catastrophic events like Superstorm Sandy and Hurricane Irene, the seminar, hosted by the Town of Oyster Bay, included representatives from the National Hurricane Center, NOAA (National Oceanic and Atmospheric Administration), Nassau County, and PSEG. Of particular interest to the NSWCA were discussions regarding the improvement of forecasting and outreach, including partnerships with national, state and local emergency operation centers. The Nassau Suffolk Water Commissioners’ Association (NSWCA) is comprised of water commissioners from 21 Nassau County and Suffolk County water districts. The association is dedicated to communication, efficiency and best practices among Long Island’s water districts. As part of its mission, NSWCA holds monthly educational meetings sponsoring experts on various topics that include law, cost efficiencies, rules and regulations, as well as other issues germane to water utilities. For further information, please contact Nassau Suffolk Water Commissioners’ Association President, Mr. Howard Abbondondelo, via phone, (516) 621-3610, or via email, awd11577@optonline.net. 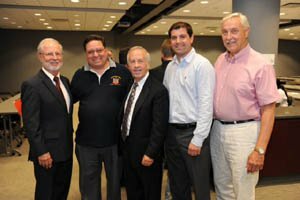 Photo Caption: Pictured from left to right at the recent Hurricane Seminar held at the Morrelly Homeland Security Center, Bethpage, NY are Bill Korbel Chief Meteorologist News12, Nassau Suffolk Water Commissioners’ Association (NSWCA) Secretary Andrew Bader of Plainview Water District, Town of Oyster Bay Deputy Commissioner Leonard B. Symons, and NSWCA members Michael Rich and Richard Niznik of Oyster Bay Water District. Subject: LongIsland.com - Your Name sent you Article details of "Hurricane Preparedness Taken To Heart By Nassau Suffolk Water Commissioners’ Association"